Because of all the focus on the botched startup of the Obamacare website and the appropriate focus on the president's lies about people being able to keep their health insurance plans, this story a couple of weeks ago has gone beneath the radar screen. It is truly mind boggling to me. Oct. 25, 2013: From the Project On Middle East Democracy [POMED]: "According to the Washington Post, the administration says “relations with Libya have ‘normalized’ over the past two years and that the Libyan government has earned the rights to have better access to the U.S.” The article also states that the rules change would “offer military training to Libyans so they can use those skills to rebuild their armed forces, including training in aviation maintenance, flight operations and nuclear-related studies." With the Libyan Al Qaida terrorist attack in Benghazi just one year removed, the US government wants to train [militarily] Libyans in the United States. 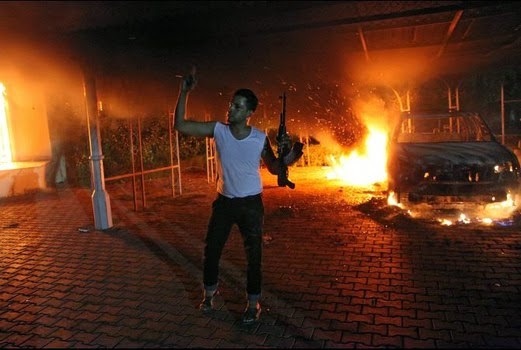 October 24, 2013: This from The Washington Times: "The Obama administration has drawn up draft rules that would end a decades long ban on Libyans getting military training in the U.S., according to documents obtained by House Republicans who said Thursday that it’s the wrong move after last year’s Benghazi attack." "The administration says relations with Libya have “normalized” over the past two years and that the Libyan government has earned the right to have better access to the U.S., which imposed the ban in 1983 after a wave of terrorist attacks involving Libyans." 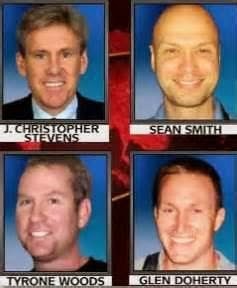 The United States rightfully had a ban on Libyans access to the US that lasted for almost 30 years because of their involvement in terrorist activity, and now just one year after a despicable terrorist attack in Benghazi that killed Ambassador Chris Stevens and Sean Smith and Tyrone Woods and Glen Doherty, is this administration really considering bringing Libyans to the United States to train them in aviation maintenance, flight operations and nuclear related studies? Are you kidding me? Thank God some Republican congressmen are on to this and are speaking out against it. "House Judiciary Committee Chairman Bob Goodlatte, Virginia Republican, and Rep. Jason Chaffetz, Utah Republican, said Libya remains a dangerous hot spot and relaxing the rules is a bad idea.“We still haven’t gotten to the bottom of the Benghazi terrorist attacks and continue to face additional terrorist threats from Libya, yet the Obama administration is preparing to lift a long-standing ban that protects Americans and our interests,” said Mr. Goodlatte, whose committee obtained the draft document. “The Obama administration should focus its attention on getting answers to the lingering questions surrounding the Benghazi terrorist attacks and ensure that Americans are kept safe and sound,” he said". Amen, Chairman Goodlatte. Keep your focus on this. God watch over this country these next three years. The man who promised he would fundamentally transform the United States of America is doing just that. Sadly, I say.